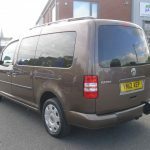 A Caddy in toffee brown with rear privacy windows – lovely looking vehicle. 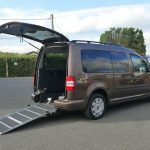 The conversion is by Brook Miller and the vehicle adapted with a lowered floor and ramp with a width of 29.5 inches providing easy access into the rear. The inertia restraints in the back attach to the front of the wheelchair and provide a no roll back facility for extra safety. 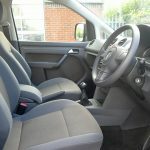 Once the wheelchair is in the right position, the rear restraints attach to the rear of the wheelchair and together ensure that the wheelchair is safely secured in the vehicle before commencing any journeys. 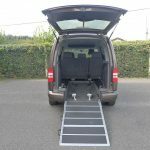 The safety belts then ensure that the wheelchair user is safe and secure so that they can enjoy travelling around in this WAV. There are even drink holders in the rear – always very useful. 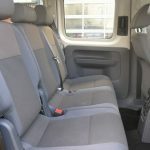 The rear seats are adjustable and can be folded down providing the wheelchair user with a surface to use and creating extra space (or, of course, for additional passengers to use). 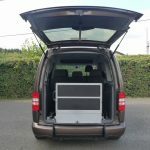 There is an overhead storage shelf situated in the front – ideal for placing items out of sight and to keep the vehicle nice and tidy. 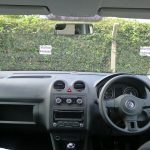 On those warmer days and longer journeys, the air conditioning can keep all occupants of this VW nice and cool. 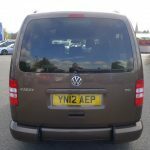 If privacy is required, then look no further as the rear windows have been tinted and we believe they also enhance the look of this quality vehicle. 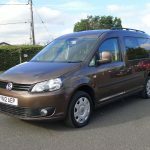 A vehicle that ticks all the boxes. 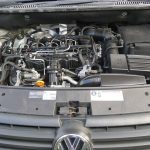 Driving the Caddy is a real treat – smooth and with plenty of power from the 1.6 cc diesel engine with manual gearbox. 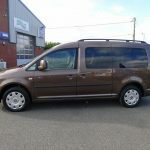 If you click on the specification section on this webpage you can see a full list of the features all there to benefit the new owner of this WAV. If you require any further information or advice, then please check out the ‘Advice’ section above, or simply give us a call on 01824 707773 and speak to one of our experts. 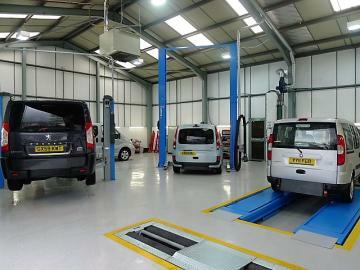 All of our vehicles come with 12 months MOT, 12 months warranty and are serviced/valeted in our very own State of the Art Service Department.